Research shows that children thrive while learning through play. In fact, for younger children, many researchers agree than play should be the main form of learning. Imaginative, creative play can open doors at an early age that may never be opened otherwise, and adding in an element of realism can only heighten the experience. Kids lab coats can help with this in several ways. Here are just a few. Imagine playing doctor or nurse with a real lab coat. 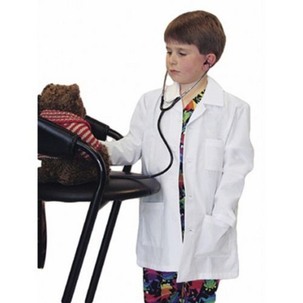 Add a stethoscope and a medical bag with some fun props and your child will enjoy hours of play in their own little doctor’s office. While props such as these are not necessary for imaginative play, the added realistic touch can encourage further play and expand the imagination to stretch across lines it may not otherwise be willing to push. A kids lab coat can also add opportunity for critical thinking and age appropriate research. Try asking the child to think about other jobs people where people wear lab coat. Answers could include scientist, pharmacist, or even lab technical. If children are unsure, take the chance to start developing research skills. Try looking up jobs that require lab coats on the internet, or take it a step further and make a trip to the library for age appropriate books about various jobs where lab coats are worn. Try letting kids wear a lab coat while conducting real science experiments. Most children love science, and being in uniform will make the experience even more exciting. A bonus is that the lesson learned may stick better. The library is full of books with science experiments for all ages, and the internet has no shortage of the same information. Try making one day a month a “science day.” Pull out the lab coats, add some goggles, and start learning! Of course, there is no need to limit kids lab coats to formal games or learning. Just hand them out and let their imagination soar. Watch and be amazed at what the kids can come up with when left to their own devices. You might just be surprised. However you choose to use them, whether as props in imaginative play, to enhance educational experience, or to just let them do their own thing, there is no denying that dress up clothes such as lab coats are a must have for learning and play. My Little Doc Brand Products are designed to be a High Quality, Value Priced Alternative to our Competitors products. 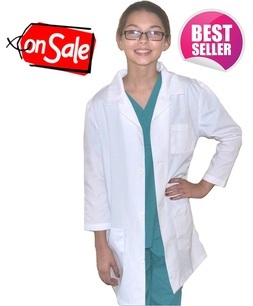 Every little doctor or nurse needs one of these authentic Kids Lab Coats!